Always the classic concept, we’ve finally added the nautical flag needlepoint belt to our personalized needlepoint shop. International maritime signal flags were used around the world for hundreds of years. Flags would be hoisted to communicate between ship captains. Each of the flags on the belt stand for a letter, and the needlepoint belt below spells out Jacob Payson Chamberlain. Order your own custom needlepoint canvas, and we will adjust the flags to your request and fit it to your exact waist size. If you’d like to change the background color or modify the design in any way, feel free to contact us directly, we’d be happy to help design the belt of your dreams! If you have been on our website today, you will notice three changes. #1. We now offer Waverly needlepoint wool for our custom needlepoint kits. This is a 3 ply wool that is similar to Paternayan. The main difference with Waverly, is that all three plys are the same thickness. It is made by the Brown Sheep Company right next door in Nebraska. The wool is actually raised in our home state of Colorado! #3. 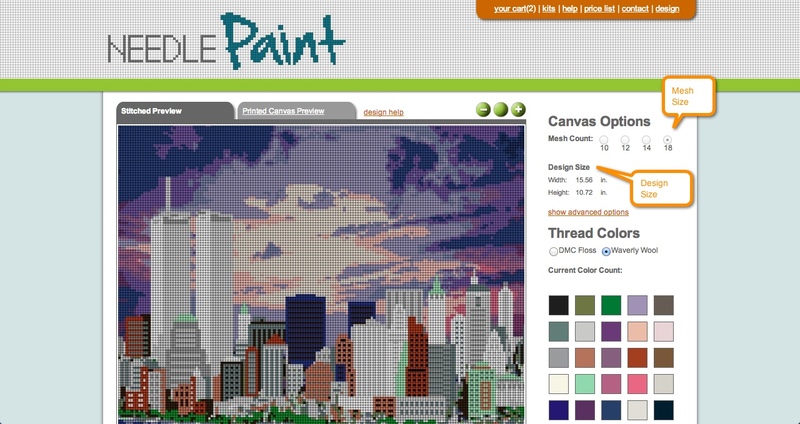 The maximum needlepoint canvas size is no longer 13 x 19 inches, we’ve increased the maximum size to 40 inches wide! This is brand new and we are still testing it, so if you encounter any problems, please email us. Your help is greatly appreciated! We are making custom needlepoint pillows! These two pillows were just finished and look great! You can look at our website for some of our modern needlepoint designs, personalized needlepoint designs, or if you’d prefer us to make a custom pillow with your own design, we’d love to do that. Both pillows in this photo are stitched using wool, and are on 12 mesh canvas. Prices for ring bearer pillows start at $100 and for 14 x 14 inch pillows start around $160. We go by the number of stitches and size. Of course, if you’d prefer to stitch your own needlepoint canvas, we’d be happy to help with the needlepoint design, and also offer a pillow finishing service. I think all of our readers will appreciate how well this custom needlepoint canvas turned out this week! 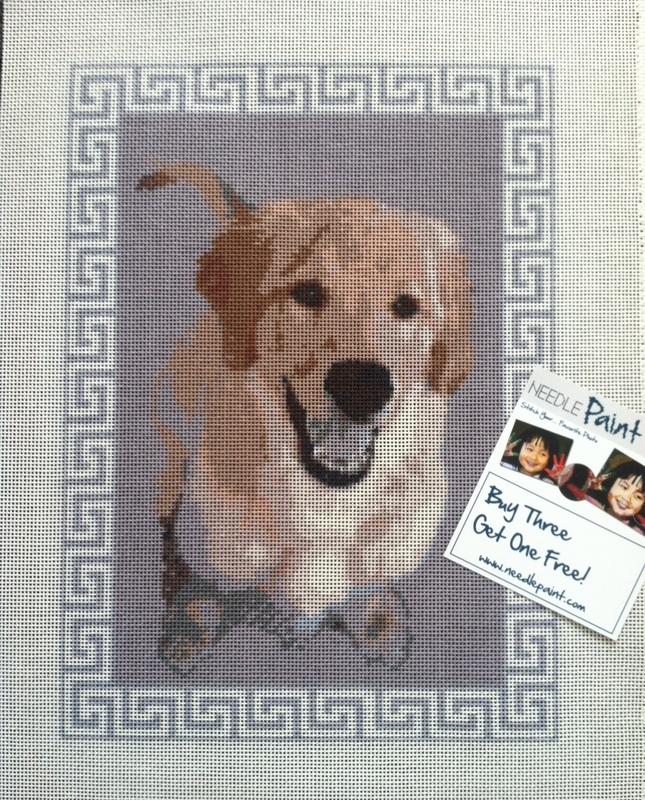 Our customer requested a greek key border to go around their dog, and to remove the background so they could needlepoint the dog in the photo. 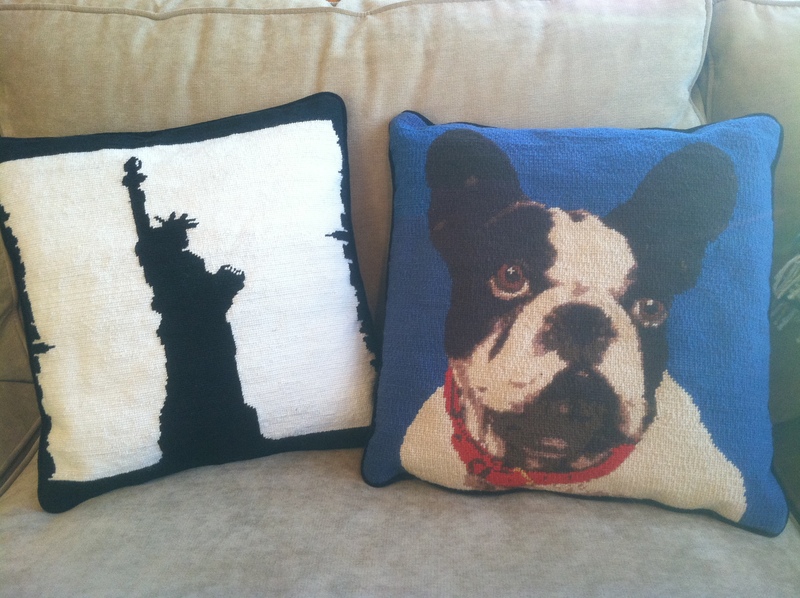 If you have a photo to needlepoint, we can help! Just email us the photo and your ideas, and we’ll make a digital preview for you. We had a fun project last week that the customer has agreed to share with everybody! 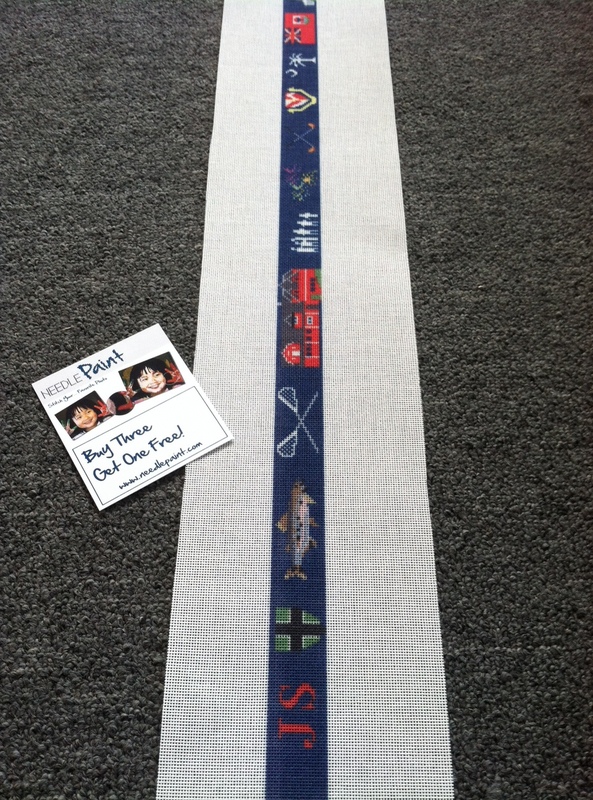 This needlepoint belt is a collection of places, events and symbols. It is being made as a graduation gift. I’m calling it a Life Treasures belt. We started with about 20 ideas, and then they decided to get the grad’s opinion to make sure they like all the elements.